Hello and welcome to the 291st installment of the SWD. Syrian Arab Army briefly captured Burj Sabineh village west of Khanaser from Hayat Tahrir al-Sham, before the latter recaptured it hours later. Syrian Security Forces discovered two mass graves in Al-Wavi village containing remains of the soldiers belonging to the Syrian Arab Army and civilians killed by the Islamic State. Syrian Arab Army’s soldiers found in the mass grave were killed by the Islamic State after the group captured Al-Tabqa airbase in 2014. Exhumation of the mass graves continues and so far, remains of at least 115 individuals were found. 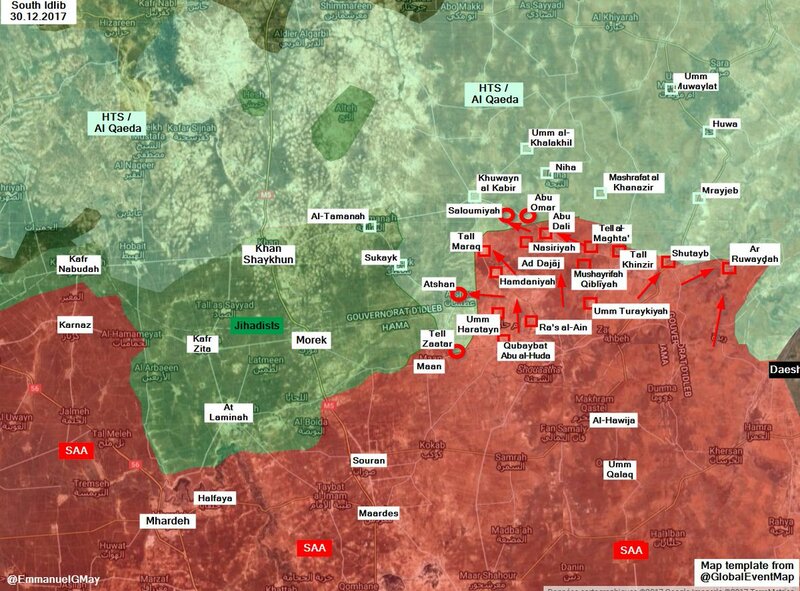 Syrian Arab Army captured Atshan, Saloumiyah, Abu Omar, and Tell Zaatar from the rebel factions in the southern Idlib – northern Hama region. Free Syrian Army’s 1st Coastal Division destroyed Syrian Arab Army’s T-62M tank and a ZU-23-2 anti-aircraft twin-barreled autocannon with two TOW anti-tank guided missiles on Abu Lafa front in the northeastern Hama. Ahrar al-Sham reportedly fully captured Al-Ajami neighborhood of Harasta from the Syrian Arab Army. The capture comes a day after an SVBIED targeted SAA‘s positions in the neighborhood. Ahrar al-Sham also reportedly captured the road between Harasta and Arbeen and cut Syrian Arab Army’s supply route to the ‘Army Armored Vehicle Base’ and Technical Institute in Harasta. Syrian Arab Army’s Brigadier General, Mohammed Yousef Janad was killed yesterday during the clashes with Ahrar al-Sham in Harasta. Syrian Arab Army launched an attack against Jaysh al-Islam around Al-Nashabiyah in the eastern part of the East Ghouta. Syrian Arab Army captured four points in and around Al-Nashabiyah. Jaysh al-Islam launched a counterattack to regain lost points and allegedly killed seven SAA‘s elements. Faylaq al-Rahman’s security detachment released Anas al-Kholi, journalist from the East Ghouta, after he was arrested for unknown reasons by the group. The initial order to arrest Al-Kholi reportedly came from the leader of Faylaq al-Rahman, Captain Abdul Nasr Shamir (Abu Nasr) himself. Evacuation of the fighters of the rebel Jabal al-Sheikh operations room, rebel fighters from Daraa and Quneitra and their families took place, as five buses reportedly evacuated 150 fighters and 20 families from Beit Jinn pocket towards Daraa. Two Syrian Arab Army’s improvised explosive devices destroyed a vehicle of Jund al-Malahim and killed four fighters of the group, on the road between Al-Karak al-Sharqi and Rakham. Rebel “Daraa Martyrs Documentation Office” confirmed the death of four fighters of Jund al-Malahim by SAA‘s improvised explosive devices. Jund al-Malahim reportedly joined Ahrar al-Sham in 2015. Iraqi Army’s 11th Infantry Division conducted a raid in the area of Meredi market in Madinat al-Sadr, Baghdad city. Army reportedly discovered a workshop used to manufacture and alterate weapons in the area and confiscated large quantities of weapons. Furthermore, a number of wanted individuals was arrested in the raid. Afghan National Security Forces killed 11 elements of the Islamic Emirate of Afghanistan (Taliban) in Pashtun Kot district. Among the killed Islamic Emirate of Afghanistan’s elements is a local commander. Afghan Local Police’s element was wounded in clashes with the Islamic Emirate of Afghanistan in Taijim area of Almar district. Islamic State reportedly beheaded three people in Sezab area on charges of cooperating with the government of Afghanistan. One of the beheaded individuals was reportedly a religious scholar. Islamic State established presence in Drzab and Ghosh Tepeh districts with a significant number of foreign fighters from Uzbekistan, France, Algeria, and Russia (Chechnya). Afghan National Security Forces are reportedly preparing to start operations to remove Islamic State’s presence in the province. Islamic Emirate of Afghanistan raided Afghan National Army’s checkpoint in Marawara district, killing one and wounding another soldier. Afghan National Security Forces killed an element of the Islamic Emirate of Afghanistan and destroyed a motorcycle in Alasay district. Afghan National Security Forces killed nine and wounded one fighter of the Islamic State in Achin and Haska Meyna (Deh Bala) districts. Islamic Emirate of Afghanistan assassinated judge Hakeem Khan in the city of Jalalabad, capital of Nangarhar Province. Similarly, Islamic State’s Amaq Agency reported assassination of an element of the Afghan National Police in the city of Jalalabad. Islamic Emirate of Afghanistan shelled Afghan National Police’s main headquarters in Sherzad district, killing two and wounding three policemen. Islamic Emirate of Afghanistan’s sniper killed an element of the Afghan Local Police in Surkh Rod district. Seven elements of the Afghan Local Police defected to the Islamic Emirate of Afghanistan with their weapons in Chaki Wardak district. Islamic Emirate of Afghanistan raided Afghan National Army’s checkpoint in Qali Charkh area of Qadis district, killing one and wounding another soldier. One fighter of the Islamic Emirate of Afghanistan was killed and two wounded in the raid. Similarly, Islamic Emirate of Afghanistan raided another Afghan National Army’s checkpoint in the vicinity of Dara Bom district. Afghan National Security Forces’ operations against the Islamic Emirate of Afghanistan in Andar, Qarabagh and Gelan districts resulted in killing of 11 and injury of 12 fighters of the group. Islamic Emirate of Afghanistan ambushed a group of elements belonging to the Afghan Local Police in Jani Khel district, killing two elements of the local police and seizing their assault rifles. Afghan National Security Forces conducted operations against the Islamic Emirate of Afghanistan in Pusht Rod district, killing six and wounding six elements of the group, as well as destroying two vehicles and several weapons depots and ammunition caches. Afghan National Security Forces killed three and wounded four fighters of the Islamic Emirate of Afghanistan in the city of Tarinkot, capital of Urozgan Province. Islamic Emirate of Afghanistan’s snipers killed four elements of the Afghan National Army in Kotwalo area of Tarinkot city. Islamic Emirate of Afghanistan raided Afghan National Army’s checkpoint in Garaband area of Seyurie directorate, killing two soldiers. Islamic Emirate of Afghanistan’s improvised explosive device killed two elements of the Afghan National Security Forces in the vicinity of Faizo Killi area of Mizan district. Islamic Emirate of Afghanistan’s improvised explosive device destroyed Afghan National Army’s armored personnel carrier in Lakh Shakano area of Delaram district. Afghan National Security Forces conducted operations against the Islamic Emirate of Afghanistan in Garmsir and Marjah districts, killing ten fighters of the group. Furthermore, ANSF arrested ten individuals suspected of belonging to the IEA and destroyed a base and several weapons depots and ammunition caches during the operations. Afghan National Army’s elements arriving in Abi Zharanda and Malik Charrahi areas of Marjah district were ambushed by the Islamic Emirate of Afghanistan and the group’s improvised explosive devices. Islamic Emirate of Afghanistan reportedly destroyed four armored personnel carriers, killed 12 and wounded seven elements of the Afghan National Army. Among the killed ANA elements is commander Abdul Rahman. Two fighters of IEA were wounded in the attacks. Afghan National Police and Islamic Emirate of Afghanistan clashed during the night in Basharan area of Lashkar Gah city, capital of Helmand Province. Three elements of the Afghan National Police were killed in the clashes. Islamic Emirate of Afghanistan’s improvised explosive device killed two elements of the Afghan National Army in Awpashak Manda area of Lashkar Gah city. Islamic Emirate of Afghanistan’s vehicle-borne improvised explosive device destroyed a vehicle belonging to the Afghan National Army’s commander Khoriaye. The explosion killed and wounded five elements of the army, including the aforementioned commander. Islamic Emirate of Afghanistan’s improvised explosive device destroyed Afghan National Army’s tank in Khonsizo area of Dand district. Another Islamic Emirate of Afghanistan’s improvised explosive device targeted Afghan National Army’s convoy in Obo Kala area of Maruf district, heading towards Atghar district in Zabul province. The explosion destroyed a truck and reportedly caused several casualties among the army’s ranks. Islamic Emirate of Afghanistan shelled Afghan Local Police’s positions in Jangle area of Arghandab district, killing three elements of the local police. Islamic Emirate of Afghanistan also attacked Afghan Local Police’s reinforcements heading towards the shelled area, reportedly causing several casualties. Islamic State’s sniper killed Egyptian Army’s soldier in Karam al-Qawadis area, west of the city of Al-Sheikh Zuwaid in the North Sinai Governorate. Two Islamic State’s improvised explosive devices destroyed two armored vehicles of the Egyptian Army in Billa area of Rafah city.